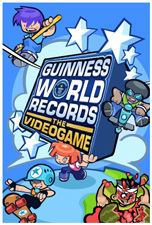 Developed by TT Games, creator of best-selling console games “Guinness World Records: The Videogame” and “LEGO: Batman,” the “Video Game Score” challenge is the first iPhone app to feature GameSpy online technology which provides sophisticated score tracking and recording for global, national, regional and buddy leaderboards. * “Cockroach Eating” – Feeling hungry? “Eat” the most in-game arthropods in the fastest time possible without ever having to touch a real bug. The current real life Guinness World Record of 36 cockroaches eaten in one minute was set by Ken Edwards. Mmm… crunchy! * “Melon Crush” – Feeling destructive? Smash the most watermelons with your head in one minute to beat John Allwood’s actual Guinness World Record of 40, without ever having to pick seeds and bits melon out of your hair. * “(Largest) Bubblegum Balloon” – Chad Fell’s current real life Guinness World Record bubblegum bubble had a diameter of 20 inches and took more than three pieces of gum to accomplish, but all you need is the game app. Fans can view the games’ global leader board by visiting www.guinnessworldrecordsgame.com. The Guinness World Records app works with iPhone 3G, the original iPhone, and iPod touch and is available now on the App Store for $4.99 usd. This entry was posted on Wednesday, July 15th, 2009 at 9:30 am and is filed under Contests, Everyone 10+, Mobile. You can follow any responses to this entry through the RSS 2.0 feed. You can leave a response, or trackback from your own site.